A very comfortable, modern, two bedroom, full air-condition penthouse, panoramic views of stunning scenery of the new harbour, the coastline and Five-finger mountains. All modern facilities, including a built-in outdoor BBQ. Easy distance from the shops and restaurants of the old town centre and Crusader harbour. Perfect for a self-catering holiday in Cyprus.The Penthouse has its own private terrace patio that blends into the rest of the accommodation through wide folding doors to make it one large area. Sit back and enjoy a sundowner while the evening sun illuminates the coastline and the five finger mountains on 2 sofas, coffee table, 6 seater dining table for outdoor living. The 14m shared swimming pool has private sunbeds and mature vegetation to give more privacy. Travel, Transfer & Car Hire: Our local agent will arrange airport pickup from Ercan or Larnaca. He also does car hire and his Ercan pick up is free if you hire from him. I come from a hotel background and have spent my life ensuring the holidaymakers have a time to remember and that all their needs are catered for with as little effort or hassle on their part. We really liked the town of Kyrenia and this gives us the ideal combination of stunning seascapes and mountain views, yet only 7 minutes walk to the old town or the old Crusader harbour. With local shops and restaurants only minutes away you are part of the local community yet you can relax in your own oasis around the swimming pool, which is never busy or on the total privacy of our large penthouse terrace. The French windows open wide onto the large terrace making the whole area your living space. From fully shaded indoors to partially shaded outdoor dining & BBQ to fully open sunbathing. All 10m from your bedroom. The bathroom is fully tiled, has a mirrored cupboard and wicker drawer unit. All living areas are air conditioned. WiFi dongle available from Agent. There is a one off fee of £10, this is a pay as you go so may need topping up from time to time. Indoor breakfast bar but who wants to eat inside when you can dine under the stars and watch the seascape as you while away the evening with a glass of wine. With digi box receiving news, entertainment and movies in English, French and German. digi box receiving news, entertainment and movies in English, French and German. We were a bit unsure about coming to the North as we had always been in the South. We really found it great value in comparison to other parts of Europe as the Euro is so strong. The North is not so overdeveloped as the South and we really had a great time exploring all the sites. The food was fantastic with a great range from local peasant food to fine dining fusion cuisine. Lyn's Penthouse was just as it said on the tin, everything was as described or better. The view of the mountains and the seascape was a perfect match for our pre dinner drinks from the roof top. With the French windows open the living area and the rooftop terrace become one area so it was great fun to prepare meals, BBQ and eat outdoors. The local shops and markets gave us so much lovely fresh food. Lyn spent a lot of time on the email advising us on flights and answering our questions about the place. He arranged our pick-up and hire car so we had no hassle finding the address, there are no road signs and his agents Sadik and Trish met us when we arrived to show us around and give us the hire car. We had two punctures up in the mountains and Sadik came out right away to get us mobile and home in time for dinner. The apartment was clean with everything working and a well equipped kitchen for us foodies. Lyn's guide to the area gave us some memorable meals. Niazi's is one of the best traditional Turkish Cypriot meals, but our favourite was the Lamb in the Well at Deniz Kisi, only known by the locals. We discovered restaurant 14 in the old town of Kyrenia which was our favourite. We took the advice in the guide and drank the local beer, wine and spirits, these were very palatable and very good value. The Penthouse has a really handy location, we walked to main part of town with the shops and harbour side restaurants in less than 8 minutes. There is a very good corner store who will deliver and the major supermarket is 5 minutes walk away, but we always needed the car to carry our wine. We will be back and will be taking friends with us this time as it was one of our more memorable holidays. I am so pleased that Sadie and Jim had a great time. Even though we are only a small operation with 2 places in Northern Cyprus and 3 in Northern Ireland we all try to make sure that a holiday with us is easy to organise, seamless from arrival at the airport to return. My agent in Cyprus and his staff go out of their way to look after our guests, I try to give loads of guidance in advance so new visitors can make the most of their stay. When we go on holiday we like to know the best places to eat the most interesting things to do and have a bit of local knowledge, our guide does this. I hope Sadie reads this as she was uncertain about coming into the Turkish part of Cyprus and worried about the border crossing. Well Sadie I told you it would be a great holiday and according to you it was. We thoroughly enjoyed our two week break, this was our second and next year will be our third visit to Lyn's Penthouse. The Penthouse was everything that we had hoped for. The location was excellent, easy walking distance to the old picturesque Crusader harbour. We had numerous lovely evenings on the terrace. The views are tremendous, and the colours are wonderful especially at dawn and dusk. You have to ignore the debris down below in the common ground and look beyond. Northern Cyprus is still a third world country and we have to understand that there will be differences. The restaurants were very good and the fresh food was great for eating in and for the large built in BBQ. The people are really friendly and very happy. We enjoyed watching the comings and the goings at the harbour. We found it totally relaxing and would definitely return. We were well looked after when we were there by Lyn's agent Sadik and Trish who looks after the Penthouse and were really helpful. Jeanette is so right, this is why we loved the north of the island and bought the Penthouse. It is one of the few unspoilt parts of the Mediterranean, all the great features that Spain, southern Cyprus had 20 years ago before mass tourism spoiled them. The location is really great as you can walk anywhere in the town, yet you can enjoy sea, mountain and coastal views. There is even an active harbour with a small naval base to keep you amused with their activity. Sadik my agent is great as he looks after my guests from airport touchdown to departure, so there is nothing more you need to organise other than make the booking through me for accommodation, airport transfer and car hire. Wow, we really did have a great time. Our first visit to Cyprus, which we really loved. Teh scenery is stunning, in particluar the views from the balcony as we enjoyed our sundowners. A really ideal location, easy access to the best restaurants in town yet away from the crowds. The Penthouse was a great base for our trips to Famagusta and the ancient Roman ruins at Salamis. We even spent a night in the panhandle. The local staff Sadik and Trish looked after us well. Trish had the place spotless and Sadik sorted our airport pick up right to the front door with car hire at a decent price.Thanks Thelma for letting us stay in your lovely Penthouse, Karen really loved your decor and enjoyed the well equipped kitchen for quick lunches or BBQs on the Patio. It was really handy for the kids to nip down to the pool while we enjoyed the privacy of the rooftop terrace to sunbathe. The poolside was never crowded and most days there were only ourselves or one or two other families. We look forward to our return visit in 2009. 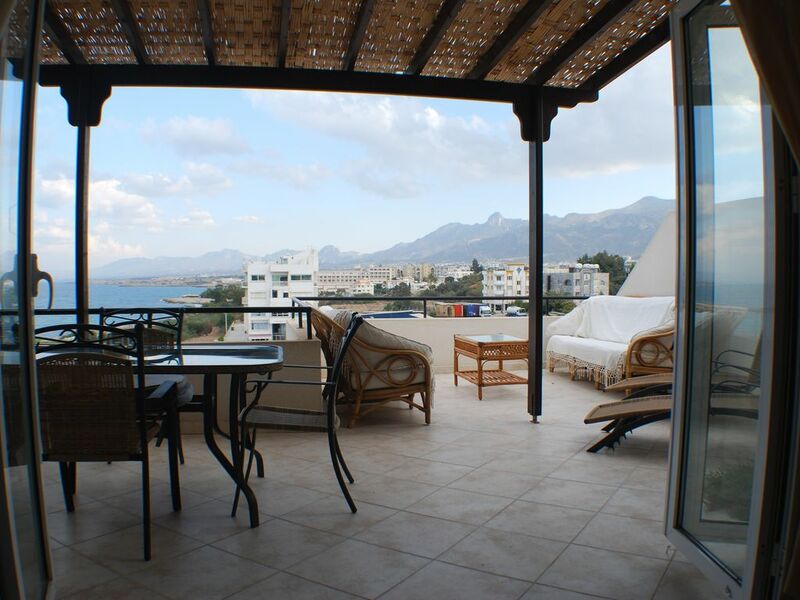 Very much enjoyed my stay at this apartment, very close to all amenities in Kyrenia, and the views are stunning. Just the place to chill and enjoy your evenings on balcony with the view of harbour lights. Your agent "Sadik" is very polite, speaks good english, and nothing is too much trouble he is available anytime. Very well maintained with all the comforts of home. Be proud of it Thelma, really enjoyed my stay, and will certainly like to visit your other villa later this year. As you say sundowners on the balconey soaking in the view was one of the reasons we fell in love with our Penthouse.We look forward to seeing you again soon. My husband and I had a wonderful time at this property so close to the amenities and lovely harbour of Kyrenia and would highly recommend the beautifully decorated apartment with lovely furnishings, outdoor furniture, swimming pool etc. All descriptions were accurate and the owner provided all information that we needed to find our way around the locality. We were also well supplied with information about 'things to do' and 'sights to see' whilst on our holiday. The views from the apartment are really stunning, especially at sunset. We have already booked to go back to Northern Cyprus. As they say this Penthouse has stunning views of the five finger mountains and the seascape along the coastline and over the new harbour, perfect for sundowners on the large penthouse terrace.It is alos very close to the centre of town, which is an easy walk away and the nearest good grocery shop is five minutes away; they also deliver to save you the bother. We are in the town of Kyrenia. We have stunning panoramic views of the mountains, the harbour and the sea. 7 mins walk from the Centre. Kyrenia Harbour offers a wide range of boating activities, day trips, deep sea fishing, Scuba training and wreck diving. The surrounding area is wonderful for hill walking, exploring Crusader castles at the sea and mountaintop, finding Roman pottery in old harbours and walking in the amphitheatres used 2000 years ago by the Romans.The restaurants around and beyond Kyrenia are superb and reasonably priced. The old Carob warehouses round the old harbour are now home to restaurants overlooking the old harbour and Crusader Castle. Niazi's restaurant at the harabour and the Tree of Idleness at Bellapais Abbey give stunning sunset views for dinner. Shopping for souvenirs is fun, you can haggle but you won't be hassled or canvassed (unless buying a tent). Remember that this is not a mass tourism location, it has charm and uniqueness of its own.